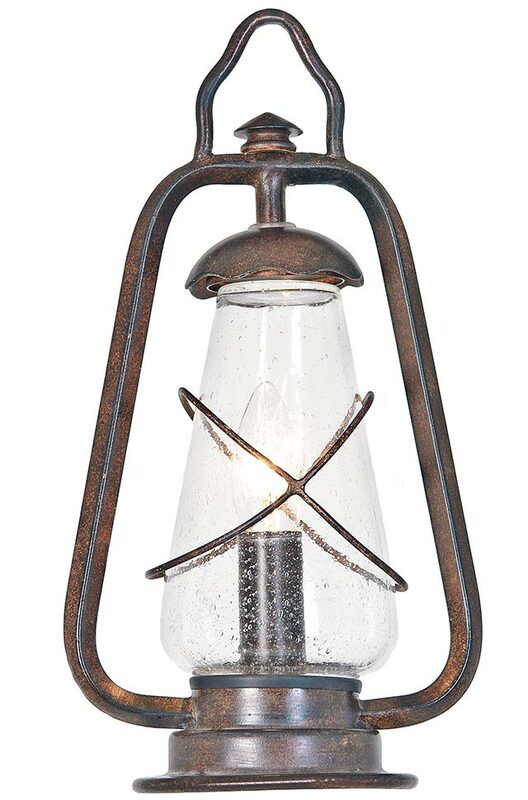 The Elstead Miners outdoor pedestal lantern in old bronze finish with seeded glass and rated IP43 is traditional and inspired by the days when they would have been lit by candles, gas or oil. Featuring circular floor mount and replica oil lantern fitted with seeded clear glass chimney and protective wire frame. Part of the country collection, this wonderful rustic post top light takes its inspiration from lanterns of times gone by. It looks fantastic outside any country cottage or rustic property and is fully weatherproof to protect against the elements. Exterior fittings must have an IP (Ingress Protection) rating which indicates the fittings ability to prevent solids and liquids penetrating the enclosure. The higher the number, the greater the protection. The minimum rating for an outside light exposed to the weather is IP23. This outdoor post lantern is rated IP43. Part of the Miners outdoor lighting range, a quality all metal outdoor floor mounted lantern. There are matching fittings in the Miners outdoor lighting range, please see below. This exterior light is supplied by Elstead Lighting, a British company that specialise in the manufacture and distribution of quality decorative lighting such as the Miners outdoor pedestal lantern in old bronze finish with seeded glass and rated IP43 you see here.